Erfurt "is in the best location. There must be a city here," the reformer Martin Luther once said. With this quotation, my team and I invite you to see the capital city of Thuringia for yourself. Your sincerely, Stefan Götz - Hotel Manager - MERCURE HOTEL ERFURT ALTSTADT Midscale hotel for business trips or vacations. The Mercure Hotel Erfurt Altstadt is quickly and easily accessible from all directions. The highway junction A71 and A4 is practically located right in the center of Germany. All of the city's attractions are nearby and within walking distance. Experimente o conforto contemporâneo em um ambiente histórico. 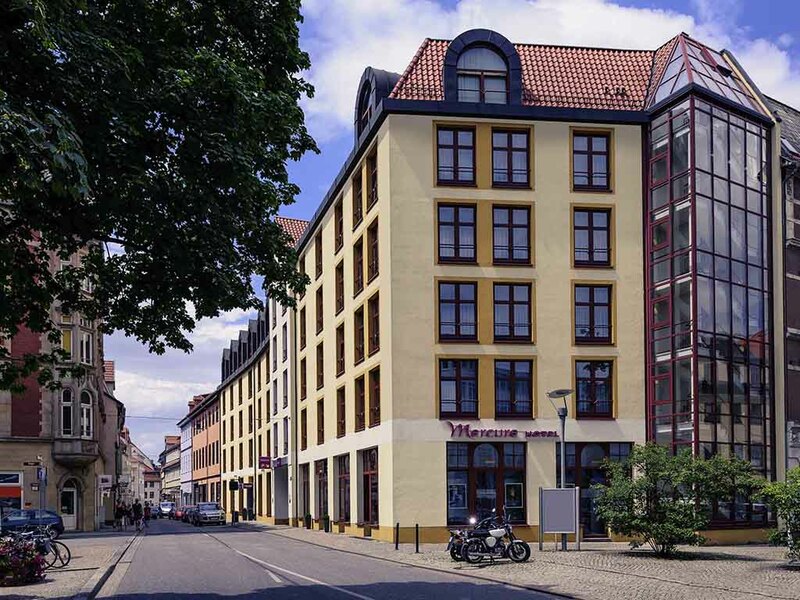 No Mercure Hotel Erfurt Altstadt 4 estrelas, você escolhe entre quartos Standard, Superior e confortáveis quartos Privilege. Os quartos Privilege dispõem de vista para o tranquilo pátio. Temos um quarto especialmente adaptado, disponível para hóspedes com mobilidade reduzida. Todos os 141 quartos têm WIFI grátis. 1 criança de até 12 anos pode dormir no quarto dos pais sem custo. Seu animal de estimação é bem-vindo (EUR 7/noite). Nosso restaurante "Zum Rebstock" funciona diariamente (exceto aos domingos), das 11h às 21h30, onde servimos pratos de todo o mundo e delícias locais. O restaurante possui um clima histórico e um lindo terraço. The contemporary hotel bar with space for 25 people is an inviting place to relax and chat with other hotel guests. Make the most of this opportunity to while away comfortable hours in a sociable atmosphere.